Abiogenesis, Atheism, Bogus Science, Cosmology, Evolutionism, Faith, Hedonism, Intelligent Design, Laws of Nature, Materialism, Propaganda, Science, Theism, There is a God! Commenting on another post, Fellow Vigilante, Reed has posted a You tube Vid of Ray Comfort’s ‘Banana argument’ for the existence of God. I am not sure whether he posted it in Ernest or in jest, as even though the argument has some merit, Ray’s particular version has been debunked. As far as simple arguements go, I prefer the Peanut butter argument… Because in spite of ridicule from Atheists, it rests on absolutely Rock solid science, and so Atheism have no valid arguements against it. A similar argument is that when we feel ill and go to the doctor… (even atheist doctors who claim to believe in Evolution) they never diagnose “a new life form has spontaneously generated in your Gut”…even when they cant find the cause of your illness. In deed if you told your doctor that you were sick and believe a new life form had spontaneously generated in your body they would burst out laughing! They certainly would not give you any credence. Because Spontaneous generation is scientifically speaking… an absurdity! Louis Parteurs refutation of spontaneous Generation has never been overthrown, never contravened…. And this is why any claims to a spontaneously generated disease would be considered ridiculous! Spontaneous generation is an atheistic myth… a naturalistic superstition. 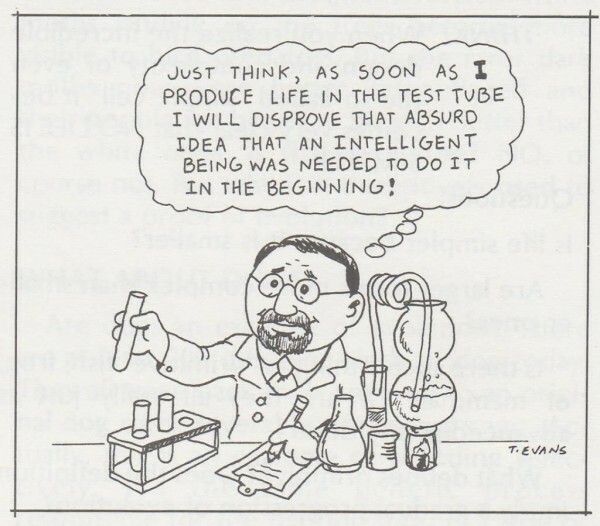 Pasteur so utterly devestated the notion of spontanious generation, that it is an absolute embarrassment to the Atheist naturalist position that they have actually abandoned using the term, insist it has nothing to do with Atheism, and now talk of ‘Abiogenesis’…. HA HA HA! Despite their claims to be applying more modern ideas…It’s the same Myth in a new Skirt! And Pasteurs Law stll holds good against it! The reality is advances in Technology and general Knowledge about single cells has indeed grown immensely yet this advance has only served to magnify, not deminish the problems for naturalism because modern geneticist today stagger at the super complexity of living cells. Modern apprehension of the complexity of the cell exposes the naivety of the early Naturalistic Naturalists whom assumed single celled life forms would prove to be quite simple… something easily imagined to be able to form by happenstance. Thus with progress over the past century the evidence has been contradicting this hypothesis. Today evolutionists must stagger at the complexity which must be achieved via self assembly …of even the most simple possible life form. Geneticists have been busy paring away at the DNA from within the most simple life form they could find to determine what genes within that cell were essential for ‘life’. Dr Craig Venter and a team of Geneticists attempted to use the smallest genome they could find as a template for the construction of artificial DNA. In the link above *He talks about the painstaking efforts… the perfect accuracy required…1 error in an over one million base pairs was enough to render their genome useless! Now what must be appreciated in respect to our topic is that just achieving this much… engineering the simplest chains of Synthetic DNA, was considered a spectacular feat… a Historic Milestone of science and Technology! And they did not create life but used a pre-existing cell ‘body’. 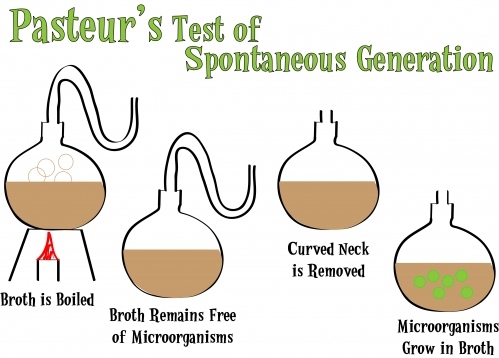 Contrary to what Atheists and Evolutionists claim these experiments and modern advances in genetic science make the Idea of spontaneous generation even less plausible… not more! That Blind Natural forces are supposed to have done much more that what Dr Venter and his team of geneticists have achieved Beggars rational belief! In deed Dr Venter has demonstrated the need for Genius and care, and purposeful manipulation to produce a technological wonder which in no way would or could form via nature or chance. In creating and installing the Synthetic DNA into this cell Dr Venter has assumed the Role of God! Pasteur has never been given his due. 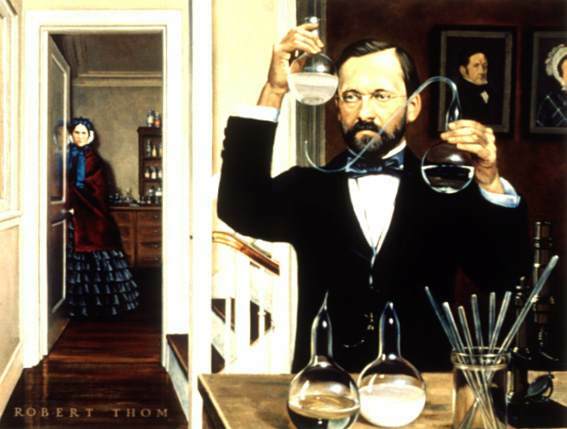 ‘Pasteur’s Law’ is absent from all biological text books… why? Because it utterly undoes the entire edifice of Naturalistic evolution! It is however a rock solid Law of Biology. Mendels Law also does this and yet because they have not been able to overthrow it with ‘Darwin’s Law’… (Because the is no such thing as Darwin’s Law)… they simply ignore the real implications of Mendel’s Law and pretend that it is a mechanism for carrying successful evolutionary traits into future generations! Thus while Medical science progresses with leaps and bounds because it does not rely on evolutionary theory, The religion of many biologists is corrupting the academic community… as ‘specialisation’/ the division of labour in scientific research and expertise means that academics in all the other disciplines accept by blind faith that Evolutionary Biology is rock solid… because they trust the biological fraternity …as experts in their own field… ie The Physicist rarely feels competent to question the publications of the Biologist… even when their claims appear to contravene the known tendencies of physics…in particular the tendency towards entropy. They assume the biologists are applying rigorous scientific method… and being Naturalists… it is assumed that Naturalists are brutality clinical and incapable of fostering let alone imposing personal prejudices onto raw data. Ie the Naturalist is automatically assumed to be of higher scientific calibre…more objective, and thus a superior interpreter of Evidence and data to that of the ‘mysticism’ which haunts the theistic mind. Thus being of Naturalistic faith, and specialisation in the various fields of science has all worked to protect and perpetuate the myth that Evolution has scientifically validity… and that Creationism is ‘unscientific’. King James Bible believer/ Dispensationalist/ Libertarian. I posted Ray’s banana argument because it is funny. As an aside… a poor argument does not affect the truth of a proposition. “Abiogenesis is most definitely true, and this is likely how life appeared! You guys know that abiogenesis and spontaneous generation are NOT the same thing, right????? In the past people believed that mouses were born fro rags, for example, that is spontaneous generation. Note how he considers his version of spontaneous generation to be more plausible than the ‘archacic’ ideas which preceded them… even though progress in genetics have revealed the notion of a simple cell to be a myth. Note how this deluded moron thinks his Abiogenesis some how side steps Pasteur!.. and yet despite his more sophisticated arguments , spontaneous generation seems even more impossible now than in Pasteur’s day. I have added two paragraphs on Craig Venter’s Artifical DNA to clarify what I maen about how the ‘simple cell’ is a myth… and cannot be credibly talked about in Biology… thus anihilating Atheist dreams of Sontanious ‘Abiogenesis’. Ray’s particular version has been debunked. All very good, but debunking Abiogenesis or similar does not mean some 2000 year old dead jewish chap is god, does it? If not “some 2000 year old dead jewish chap,” then who? Without abiogenesis Atheism becomes awkward. What ought to give you pause most is how you have been lied to by atheists… How they falsely claim science is on their side, and say that science has proven the Bible wrong… All these atheist claims are false! It is The Atheist whom is the Anti-science superstitious fool… whom grants Matter ‘God like’ atributes. This particular Blog post may not be sufficient on it’s own to convince you that Jesus is really whom the Bible says that he is. I never expected it to be. It is but one Fact of reality that you need to assimilate into your understanding. I suggest you click on some of our categories in the sidebar… more on atheism, theism, the King james bible etc. I expect You will find many different arguements which collectivly provide a very good case for believing Christianity. In my veiw One of the greatest proofs that the Bible is true is that’s it’s description of the nature of Mankind. The explanitory power of the story of Adam and Eve, and their fall into sin, is absolute. Ie All mankind fits into it’s scope… as sinful, perverse beings. ie There are no Noble savages… no families/tribes that dont have Liars, thieves, and murderers… etc. Despite the huge variations between Nordic Giant, and Pygmy, the Bible correctly declared mankind to be one family, all decended from Adam and Eve… and modern science has validated this! Adam and Eve are scientific facts!. I could go on, yet as I said… If you really are keen to search out the truth… you may be very supprise what you descover! I have no idea who. It is an unknown. The human mind does not cope well with unknowns. We invent gods to explain the rain, sun-eating dragons to explain an eclipse and evil spirits to explain illness. Some things are simply unknown, perhaps unknowable. It takes some courage to face this uncertainty and embrace our short-life anyway. Believing in Neptune, Apollo and Ganesh can provide some comfort but it is a placebo. One of the reasons I blog on solo is to find out if Atheists truly believe there is no God. I had thought that you might be the first real Atheist I’d encountered (because your moral perspectives would follow from Atheism) but you’re not, are you? Damien also assumes everyone is as ignorant as himself. Well. Damien what do you have to say when I tell you millions of People know the Truth. That Jesus Christ is the Saviour of Mankind. None of us may be able to move you out of you unbelief… yet this does not mean we cant prove we are right. It just means you refuse to know… for example… saying that our belief in Christ holds no more weight than believing in Zeus… thats a very lame arguement…. Quite false. That does not attact the verasity of the Bible at all. if you demand to put your fingers in the Nailholes of Christ before you believe, I am sorry I can’t present you with that level of certainty, yet if you have the integrity to ditch all your petty/ false arguements which block you from objectivly considering the Bible… you will realise that the Bible stands sure and bright. It Tells you the truth. One day you will stand Before The Holy… God Almighty. No. I think that there is no god. I do not know that there is no god. Likewise, I do not think I am actually a dreaming unicorn, but I cannot know that I am not. The probability is about the same. These are statements from you about your view, but they are not evidence of anything and they are not, in themselves, an argument that I can engage with. I can tell you I am a unicorn and that I am certain of this. You will look at me and decide I am not a unicorn. The depth of my belief will not convince you, and nor should it. You can see what I am and see what I am not. You show that you have not allowed yourself to apprehend what this blogpost clearly proves! Scientifically speaking probablity is greatly in favour of the existance of God, and against Atheism! Ie The probablity that Life spontaniously generated and then evolved into you is so astronomical as to be beyond reason. So please spare us the lecture about Probablities! You show that your atheism is irrational. You simply refuse to accept the evidence. 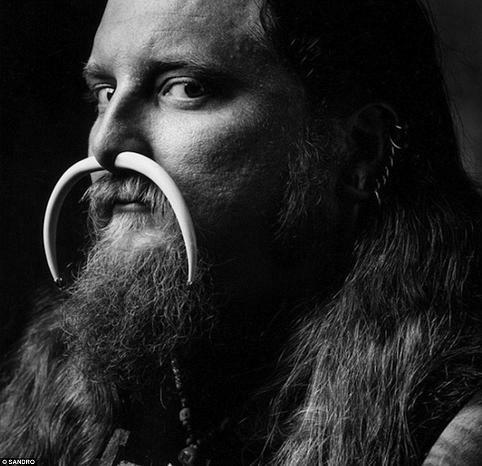 Jumping in late to this, but I ran across it searching for images and was intrigued by what a guy with a massive septum bone had to do with spontaneous generation. You guys all need to go read your history. Engels dispatched this exact argument in 1883. See his Dialectics of Nature. The seeming impossibility of abiogenesis is an illusion: nothing more than the inability of the human mind to grasp what 4 billion years is like. The line between improbable and impossible becomes blurred. You might as well argue about whether action at a distance is possible. It’s done. Over. Out. I couldn’t find Engel’s argument. Would this (Multiplying Absurdities Equals Certainty… The Math Magic of Modern Atheist Astrologers!) be a counter argument to Engel’s argument?